Sam Creasey has been announced as the winner of the Glyndebourne Tour Art Competition 2018. The south London-based artist is recognised for his work entitled ‘For Love Nor Money’. 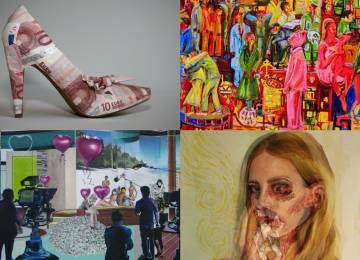 Established in 2013, the annual competition offers a platform for emerging artists to showcase their work. The 2018 competition challenged entrants to create an artwork inspired by the theme of ‘Love and Money’, a common thread that runs through the three productions in this year’s Glyndebourne Tour, Verdi’s La traviata, Massenet’s Cinderella (Cendrillon) and La traviata: Behind the Curtain, presented by Chris Addison. Born in Maidstone in 1993, Creasey studied for a BA in Fine Art at the University of Brighton and will undertake his MA in Painting at the Royal College of Art this month. As part of his competition prize, Creasey will see his winning image on the cover of 10,000 copies of the Glyndebourne Tour Programme, distributed at Glyndebourne and theatres in Canterbury, Woking, Norwich and Milton Keynes. His work will also be on display as part of an exhibition at Glyndebourne this autumn, alongside all shortlisted artworks. Made up of three conjoined panels reminiscent of a theatre backdrop, Creasey’s striking artwork portrays a futuristic-looking TV studio and includes pop culture references to singer Taylor Swift and TV show Love Island. The judging panel comprised of Glyndebourne’s Executive Chairman Gus Christie, Glyndebourne trustee Lord Davies of Abersoch and Royal Academician Eileen Cooper, whose artwork featured on the cover of this year’s Glyndebourne Festival Programme Book. Last year’s winning artist was Katie Ponder, for her piece entitled ‘Deception’. The Glyndebourne Tour was founded in 1968 by Sir George Christie and celebrates its 50th anniversary this year. It aims to make opera productions accessible to larger audiences and champion new talent. The Glyndebourne Tour opens at Glyndebourne on 12 October 2018 and then visits Canterbury (6-10 November), Norwich (13-17 November), Woking (20-24 November) and Milton Keynes (27 November-1 December). Sam Creasey’s work can be viewed at www.samcreasey.com. This year there are a host of extra exhibitions that ticket holders can enjoy at Glyndebourne.